Our world has changed drastically with the emergence of the internet. We order our dinner and wardrobe online, so why not tonight’s date? You can probably name dozens of successful relationships in your extended friendship circle that met through online dating—that’s not a coincidence. Online dating is a convenient and fun way of dating. But with so many millions of profiles you might be asking how do people find their true love on dating sites? The key can often be about choosing the best dating site to post your profile. If you want to stand out from the crowd, a dating site like Zoosk can improve your chances. The right site can provide the tools and features that do all the hard work for you (and get you more dates while you’re there). Your dating profile is the first impression you send out to the virtual dating world. With Zoosk you can easily & quickly create a profile—also known as a Date Card—and add to it later when you have more time. When you do come back to it, Zoosk will walk you through finishing your profile by prompting you to fill out a few answers about yourself and your ideal match. The more information you add, the higher the chances you’ll attract a good quality match. Yes, we live in a superficial world. We all look at profile photos first, before reading the profile itself. Since photos are so important, it’s essential you choose the right type of photo to add to your profile. Use a flattering shot, but stay away from a Kim Kardashian-styled ‘selfie’ in the bathroom, and include photos of you actually enjoying yourself and doing things you love. Upload a selection of photos so you have a range of different poses and environments. What makes Zoosk different from other sites is that it takes the best parts of dating & social networking and combines them together. Using social media can help get you more views on your profile and raise your chances of meeting the right person. Get involved on Zoosk’s community pages where you can receive invaluable advice and have your say about dating (not to mention get your profile seen). Comments on the boards are added to your Zoosk status feed, which shows up on your Date Card and on the Zoosk front page that is seen by singles in your local area. Another way to keep up to date—mind the pun!—with the dating community is to use Zoosk’s Facebook Fan page and engage with other members via the active discussion. For those that want to keep your online dating discreet, you can easily hide your activity, but for those who want to be loud and proud, you could consider launching a witty blog about your dating experiences and add a link to your Zoosk profile. What’s really unique about the social integration is that its features makes it feel more like a social hub, as opposed to a static website. Another perk of Zoosk is that you can actually invite your friends to write testimonials about you that are visible to potential matches (yes, your friends can act as virtual ‘wingmen’). After all, your friends know you best and can brag in ways you might feel embarrassed to do yourself! 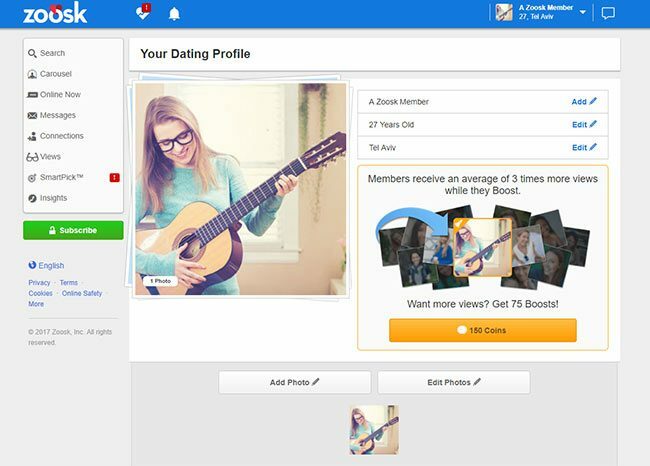 A super smart, effortless way to promote your profile is the Zoosk Boost feature. 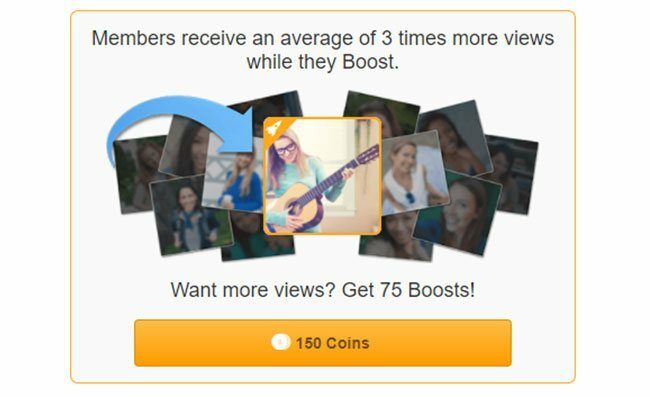 Purchasing Boost with Zoosk coins will help you get noticed and highlighted in different places on Zoosk including in people’s messages and Carousel (the search tool). Zoosk coins can be purchased, or you can earn them through onsite activities such as becoming a fan on Facebook or installing the mobile app. The more you Boost, the more you’ll be highlighted. It’s a great way to get noticed and quickly get more views and attention. Zoosk is free to sign up, but with a paying membership starting from $14.98 monthly, you’ll be able to receive and send IMs and messages, Boost your profile to appear higher in Zoosk’s search results, and get SmartPick matches. 1. The Carousel which lets you flick through singles by photos & age (based of course on who the Behavioral Matchmaking Engine thinks you’ll be interested in). This allows you to quickly decide whether you’re interested in a match. Again, the more you use this, the more Zoosk will show your profile to other people. 2. The Search; just enter your criteria ie. age, location etc and Zoosk will get to work finding as many matches as possible. 3. The Scientific Matchmaking Service; Zoosk uses scientific algorithms based off your behavior and picks one lucky single for you every 24 hours. If there’s a mutual ‘like’, Zoosk will go ahead and make the introduction. There are potentially many top dating sites you could sign up for. What makes top dating sites different are the many tools and features to take advantage of to promote your profile. Because Zoosk integrates social media so easily, online dating can actually feel fun, rather than a chore. Not to mention the more you use it, the higher the chances you’ll find Mr or Mrs Right.